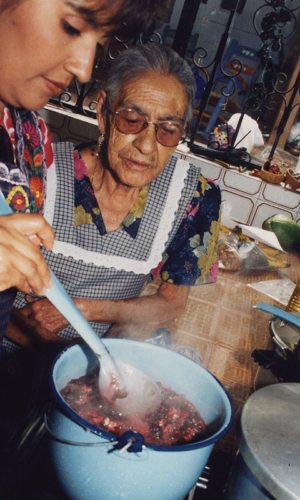 Those who visited Oaxaca’s La Casa de Mis Recuerdos B&B in the past were invariably charmed by the delightful surroundings and relaxing ambiance, but it was often the delicious meals created by Nora, using time-honored recipes and little known secrets passed down by her late grandmother Ofelia (pictured left), that left the most lasting impression. Located just three blocks from the Mis Recuerdos B&B, which is owned by her parents. Classes start in the local market, where Nora shows her students how to select the best ingredients. The marketplace is an education in itself, but it is back in the kitchen where Nora really works her magic. 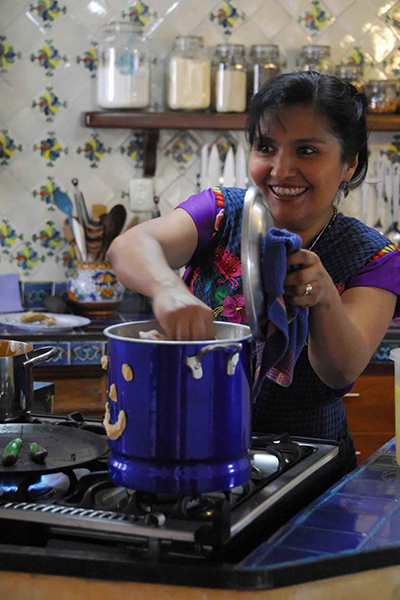 In fluent English, or in her native Spanish, she explains how to execute the recipes and class members help prepare the dishes with her supervision and guidance. Classes end with participants enjoying the dishes they have made in a multi-course meal served by Nora and her assistants, Rufina and Mari. After the actual cooking part of the class the meal that you prepared is served to you at our elaborately set main dining room table.